This shoe is back... Yes I did a review and return (HERE)... but after spending extensive time on Rakuten began to realize that there are many shoes offered on the Asian/Japanese market in a wide that are not offered in the United States. Some notable examples from Adidas include the Boston, Tempo, Takumi Sen (yes! ), Takumi Ren (that too) and the Adios Boost 2. Crazy right? I will get my hands on a few of these (especially the Adios Boost) and will let you know how they fit. For now I will give a full review on the Tempo. Why did I go back to this shoe? I have been actively looking for a light stability trainer and have been disappointed by some of the other offerings out there. I found the Mirage 5 to have an odd fitting upper and the sole broke down very quickly (looking forward to the Mirage 6 with the EverRun midsole). The Lunarglide has a horrible amount of posterior flare in the heel, which causes an early initial contact of the foot which doesn't make for a good transition. The Zoom fly felt poorly constructed. The DS Trainer 20 (REVIEW) is probably the closest thing to optimal given the 8-10mm drop and extremely fast ride. However, the lack of a heel bevel which leads to a horrible initial contact and transition ruined the shoe for me (and may have contributed to an minor achilles irritation I had). The Purecadence 4 (REVIEW) is a good shoe, but recently has been to low a drop for me. Although that shoe is listed as a 4mm drop, due to the softness of the midsole it compresses to what feels like a 0mm drop shoe. Right now I do not have the calf muscle length to train in that kind of shoe and prefer keeping my low drop shoes for workouts and races. This is something I have learned over time (the hard way) and have found it just works for me. Sole: To review my full thoughts on the sole, see my Initial Review and Return (HERE). My updated thoughts are that I still enjoy the sole of this shoe but feel like it could be better. I enjoy the firmer ride compared to other Adidas Boost shoes and have found this to be a good shoe to handle fartleks and uptempo runs. I am still a bit frustrated that the midsole Boost is concentrated mostly in the heel. I feel like this bulks up the size of the heel and leaves the forefoot a bit barren. 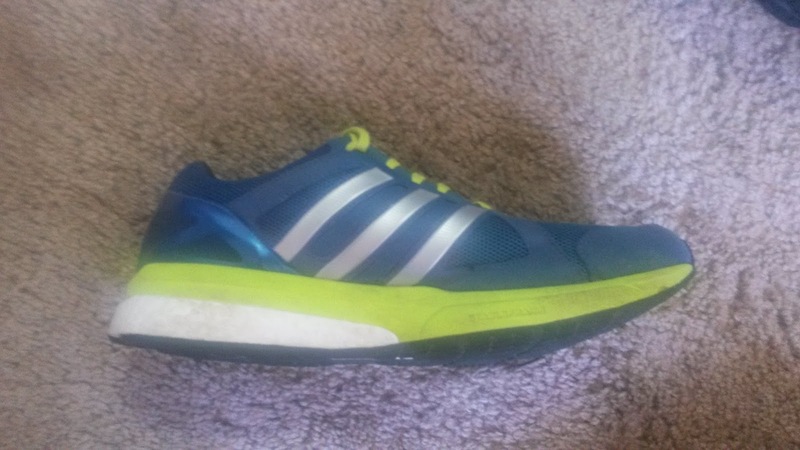 Being someone who lands with a variety of footstrikes depending on how tired I am and what is going on with my hips, I wish the Boost was better spread throughout the shoe. I previously mentioned the difference in densities is a little strange at first but I have gotten used to the feeling. Would I still prefer the Boost be spread out more evenly? Yes. The stability of this shoe is still mild but decent. While I still feel the support concentrated in the arch, after many miles in the shoe I am picking up supportive elements throughout the length of the shoe. 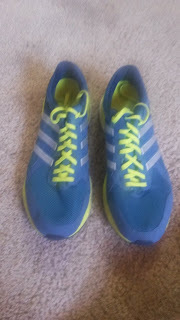 Adidas states that the StableFrame supports the foot from heel to toe and I am getting a similar feeling to what Brooks did with the Purecadence 3 (REVIEW). I can specifically feel the mild support in the forefoot in the end stages of long runs but it is very mild and most of the time I do not notice it. Upper/Fit: Now for the important part. How does Japan/the Asian market do wides? Mostly like the rest of the world where the entire shoe is wider. However, the amount that each part of the shoe widens is different. In US shoes in wide widths that I have tried, the entire shoe has been widened with an emphasis on the heel and midfoot. In the Asian market, the emphasis seems to be mostly in the forefoot with minor increases in the heel in midfoot. In the Tempo 7 wide, I mostly feel the increases in width in the forefoot with only minor increases in the width of the heel and midfoot. I do have to make sure I lace lock the heel as it is slightly too wide for my heel. However, I have not had any issues with slippage, blisters or my foot moving around. As you can see from the photo below I do have the laces fairly tight and that seems to solve any width issues while still keeping a decent size toebox. The odd part is that the toebox of the Adidas Tempo 7 wide feels like that of a normal shoe... but that is because the normal width is insanely narrow. So for those of you neutral runners who really wanted to like the Boston Boost but found the toebox similar, give the wide version a try. While the fit is better in the wide version, I still do like how fast the toebox tapers. This shoe is pretty pointed even in the wide and the only saving grace is that the upper does stretch pretty well. So it has broken in for me, but I hope this is fixed in the Tempo 8. While I have seen photos of version 8, I haven not seen a top down view of the upper/toebox. We'll have to wait until November to see what happens and if Adidas fixed this toebox issue in the normal US width so I don't have to order from Japan. I just hope Adidas goes back to the Tempo fitting snugly like a racing shoe and not what currently is (a toe-squasher). Thanks to ebay, I currently have the Tempo 5 in my rotation. 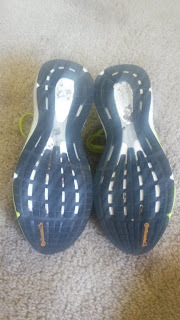 The upper, while it does taper in the forefoot a little bit, fits very much like a racing flat. Not tight but snug. I really wish Adidas had kept that fit because version 5 fits me extremely well from heel to forefoot. The normal width Adidas Tempo 7 fits wider in the heel and narrow in the forefoot while the wide width mostly fixes that issue, but something still seems off to me. Have I gotten used to the fit? Yes. I just hope it is improved. Responsiveness: I do appreciate the firmness of the sole combined with the Boost. The shoe can do double duty as a workout shoe and a recovery shoe. Would I use it for long races or fast intervals? No. Because of the increased softness of the midsole (boost), the removal of the extended forefoot torsion system and the increased weight. Yes the shoe can go when you push it correctly, but not like previous versions. It is still a relatively firm shoe, but not racing shoe firm and responsive. Heel-Toe Drop/Ramp: While this shoe is listed at a 10mm drop, it feels a little higher statically standing in it. On the run, the Boost in the heel does compress and the shoe goes back to feeling like a 9-10mm drop shoe. Durability: As with many Adidas shoes, the Tempo 7 continues with the use of Continental rubber. In the Tempo 7, the full length Continental rubber outsole gives this shoe fantastic durability. 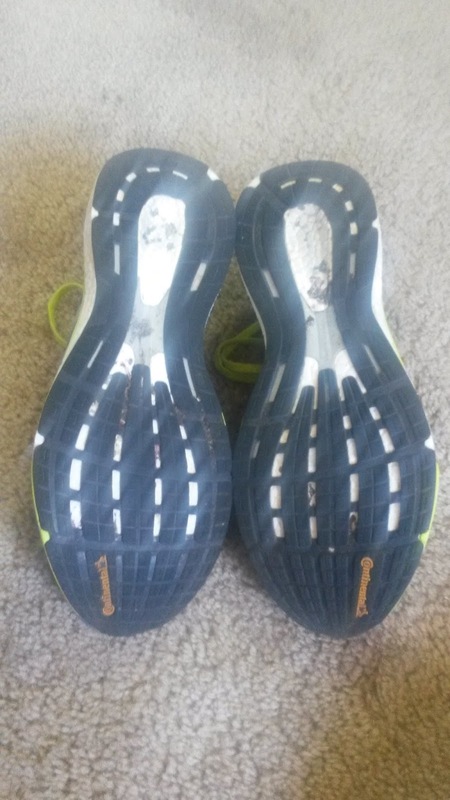 I have over a 100 miles in this shoe and am seeing very little wear on the sole. Depending on how the midsole holds up, I full expect to get at least 300-500 miles out of this shoe (maybe more). Weight: As I complained about in the Initial Review and Return, the Tempo 7 has gained an ounce in weight compared to the previous versions. How do I know that (other than specs available around the internet)? As mentioned previously, I have a pair of Tempo 5s in my possession that do feel lighter and more like a marathon racer (being at 8.4 ounces) compared to the 9.4 ounces of the Tempo 7. That is not necessarily a bad thing as the weight is still relatively light. It just means the purpose of the Tempo 7 has changed from a light stability marathon racer to a light stability lightweight trainer. Thoughts as a DPT (Student): I've said this before: Don't Scrunch The Toes!!! A snug fit is fine as long as they aren't crunched. The first issue with preventing any kind of toe splay is you lose the ability to redistribute forces in the transverse plane as pressure is place on the metatarsals and phalanges during gait. That means more forces go directly into the bones, soft tissue and even nerves. Yes. You have nerves running between the metarsals and phalanges. Don't compress those. That's why you feel your feet going numb from certain shoes that are usually narrow. That is a classic sign of nerve compression... which is never a good thing. It can also be a sign of a lack of blood flow... also not a good thing. The second issue is that long term use of shoes with highly tapered toe boxes can lead to abnormal foot posture and function. While short term use might not affect the position of your toes, long term it can contribute to conditions such as hallux valgus and bunions. Why? Because when the great toe is forced laterally and you toe off, greater forces are put into the first metatarsal head. This also happens with tight calves when you cannot make use of the talocrural joint (responsible for normal dorsiflexion and plantarflexion) and compensation from the subtalar joint occurs. The talocrural joint lies between the talus, tibia and fibular. The subtalar joint lies below that between the talus and the calcaneus. While no joint in the foot lies perfectly in the sagittal plane (straight forwards and backwards), the talocrural is much more in line that the subtalar joint, which is supposed to be used for inversion and eversion. Compensating with the subtalar joint for dorsiflexion usually results in a more everted foot position through most of the weightbearing gait phase. Which in turn causes the foot to be pointed laterally and toe off occurs more over the first metatarsal head diagonally with decreased involvement from the great toe. The TLDR version of the previous paragraph is: Tapered toeboxes may contribute to hallux valgus and bunions due to increased pressure over the first metatarsal head from compensations in the foot. Final Thoughts: So what do I want you to take away from this review? How the Asian market does wides. At least with the Tempo 7 wide, the width increase seems to be focused in the forefoot. That is exactly what I was looking for but will try other shoes like the Adios Boost 2 in a wide to see if that is consistent across the spectrum of Adidas shoes in the Asian market. I have found the wide version of the Tempo 7 to fit my foot much better than the normal width especially in the forefoot. 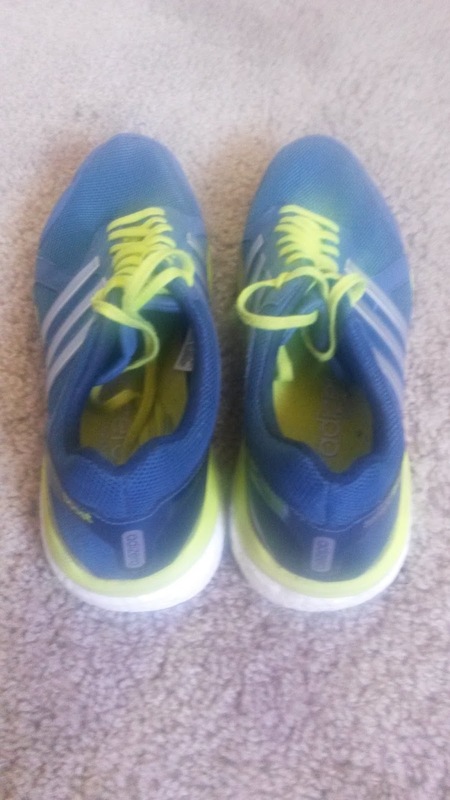 I have enjoyed the ride of this shoe and have found it to respond when I have tried to push it to moderate to uptempo paces. I would still like to the issues with the crazy fast taper in the toebox and inconsistent amount of Boost throughout the shoe fixed. I feel like the Tempo can be at the top of light stability trainers if these issues are addressed. Is it as good as the Tempo 5/6? 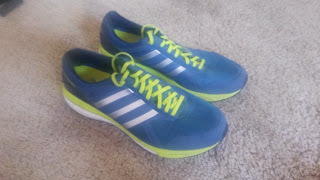 In my mind not quite in terms of speed and fit but I have high hopes Adidas will address this soon. If you are still looking for a marathon racer/uptempo shoe with mild stability, I suggest checking out the Mana 7 which I just recently reviewed (REVIEW). This will work very well as a longer distance racing shoe and workout shoe that compliments the Tempo 7 (wide) very well. These shoes were a personal purchase and are not readily available in the United States. I purchased my pair on Rakuten. I put at least 100 miles on every pair of shoes before I review them (except racing flats which I put on at least 50 miles). Currently I have 120 miles on my pair.